Anna University hall ticket 2019 for UG/PG semester exams in the Department, affiliated colleges and distance is expected to release soon. AU Hall ticket will be released at least one week before the date of examination. Anna University will publish the AU admit card on its official portal. Students have to download it from there only by using the anna university login details. 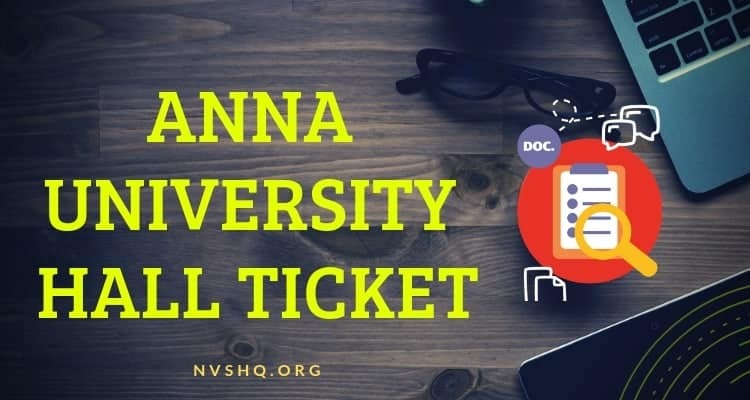 In this article, students will find important information about the Anna University hall ticket 2019. 2 How to download Anna University UG/PG admit card 2019? Examinees must note that no hall ticket will be dispatched to them on their postal addresses by the Anna University. They have to download it from the university portal within the stipulated schedule. No other mode of accessing hall ticket will be made available for the students other than the official portal. All the students enrolled in the university who are going to appear for university exams are required to produce the printed copy of the hall ticket and an identity card at examination center in order to enter the exam hall. Any candidate found without a valid hall ticket will not be allowed to enter examination hall. Therefore, candidates must ensure that they carry the hall ticket with them on each day of exam. In order to download the admit card smoothly and without any issue students are advised to download it on time before the last date. How to download Anna University UG/PG admit card 2019? Anna University Hall Ticket will be published online, university students have to download it from the official portal of university. Before the issue of hall tickets, university upload the notification on its portal so that students can get information about the issue of admit card. Visit the official website of Anna University i.e. www.annauniv.edu. On the front page of the portal, students have to search the option given for hall ticket downloading. AU UG/PG Hall ticket login page will appear. Students have to enter the register no., date of birth, security code etc. AU Hall ticket 2019 for semester exam will appear on the screen. Students now have to take multiple printout of the AU admit card 2019. Admit card is an important document for all the examinees to be carried to the examination hall. It acts as an entry ticket that allow candidates to enter the exam hall and write the exam. For all the discrepancies and issues regarding the details mentioned in the hall ticket, students should immediately contact the concerned university department. Anna University hall ticket for semester exams is likely to release soon. Students have to download it from the university website on the notified dates. Admit card will not be made available in physical form. Students must have their valid login details at the time of downloading the hall ticket. Without valid details, they will not be able to download it. They must be present at examination premises with a valid hall ticket and an ID card on the day of exam. Invigilator will not allow any candidate to enter the examination hall with the valid hall ticket. Students are advised to read all the instructions given on the admit card carefully before and during the examination. Candidates must ensure that admit card is not damaged and all the details are clearly visible. Any candidate found with damaged AU hall ticket will not be given permission to write the exam. Except the Anna hall ticket and required stationery, students are not allowed to carry any other item to examination center. They must reach the examination premises at least 30 minutes before the reporting time. Candidates will not be given entry after the mentioned time. Students facing any issue regarding the upcoming Anna University semester exams and hall ticket can contact the concerned department of university. They can also drop their issues and queries in the comment section below.